The effort of following all the available information sources on any given topic by oneself may involve a large waste of time and energy. 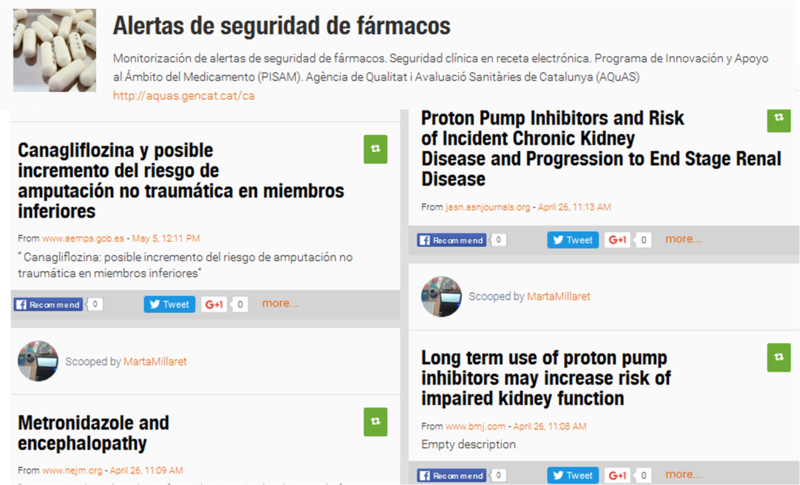 The electronic prescription group in Catalonia has developed a project of strategic surveillance and content curation focused on drug safety alerts. By way of definition, strategic surveillance is information filtering to help decision-making, which is an early alert tool, while content curation is a continuous diffusion system on the most relevant contents on a topic, addressed to specific target groups. ¿How did we do it? To develop this project we used the tool scoop®, an automatic news aggregator that allows to filter the news items, personalise them and present them within a web page and a bulletin. The methodology we followed was the 4s’s method of Content Curation (search + select + sense making + share) by content curators Javier Guallar and Javier Leiva Aguilera, authors of the book “El content curator. Guía básica para el nuevo profesional de internet” and the 4s’s method. The project started with de definition of a set of surveillance lines. In our case, it included drug regulatory agencies, assessment agencies, new drugs, new therapeutic indications, the technological evolution of prescription and electronic prescription symptoms, as well as the opinions and appraisal of professionals. These surveillance days are set on a daily basis by following up multiple information sources, including contents from grey literature, pharmacotherapy bulletins, and experts blogs. A key element of this pro is the contents selection. 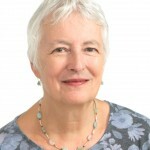 This is usually carried out with the collaboration of experts in pharmacotherapy. Once a set of contents is selected, we give it a sense. In this project we do it organising them in an essentially visual way: with a synthetic headline (drug, associated potential risk, and information source) and a link to the original piece of news. ¿What do we offer? We offer a drug safety alert monograph, specialised information that is updated at the same time as the primary sources. We optimise multiple bibliographic searches to avoid information fragmentation and infoxication. ¿For whom are we useful? Our project is useful for the updating of information systems on drug safety alerts, and for any healthcare professional who wishes to stay up-to-date in this field. Having the latest news at real time is important, and our objective is to be useful, getting the professionals closer to this information in a convenient way: through a open access web site, and through a monthly bulletin. ¿What is beyond this project? 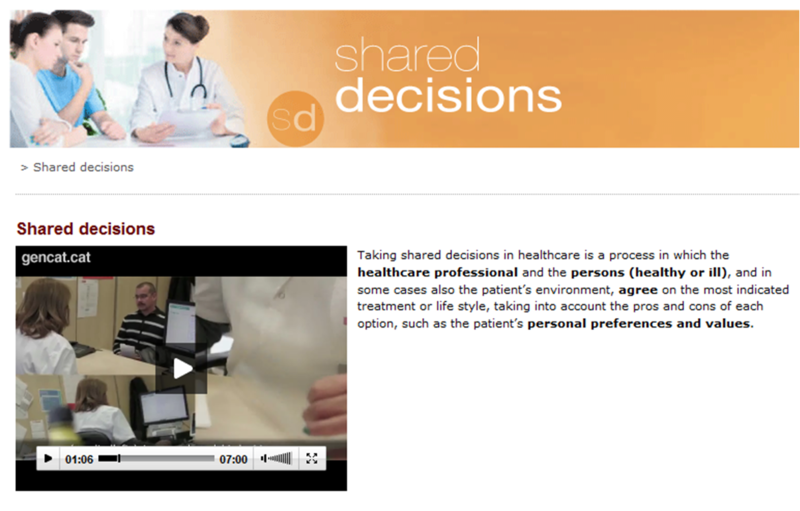 This project is an example of collaboration between healthcare professionals and information and documentation professionals. The methodology used in this project may be applicable to other objectives, defining other surveillance lines, other information sources and other target groups. Thus the project gives more visibility to existing resources, which are numerous, well known, and of good quality. Post written by Marta Millaret (@martamillaret) and Arantxa Catalán (@arantxacataln). The new Public Program of Data Analysis in Health Research and Innovation in Catalonia is in the height of the participatory and deliberative process in response to a parliamentary motion and the good will of the Department of Health. The participatory and deliberative process has been articulated in three large distinct actions: a conference of structured discussions with experts, a conference of public information and a participatory process by means of contributions from all citizens. We see everything with a little more detail. A week later, on July 12, a conference of public information was held, in which the main contributions from the discussions on July 5 were presented. Among other aspects, those emphasized are the need for transparency and the issuing of accounts to be the basic principles throughout the process, along with the need to promote citizen participation. A video of the day can be seen here. A participatory process through contributions that can be made from July 6- July 29 is now open. These contributions will be studied for their integration into the final program which will be presented this autumn. The data analysis program in research and innovation will be permanently participatory. There is the understanding that scientific progress cannot be built without citizen participation. Establishing a triangle between scientists, politicians, and citizens is one of the great challenges of our society. Toni Dedéu, director of the AQuAS, is confident that the participatory and deliberative process will serve to build the best public program that we can do together. PRINCEP is the acronym of the program from Sant Joan de Déu Children’s Hospital in Barcelona, launched in 2012 under the name of Integrated Response Platform for children with chronic diseases and high dependence. The project PRINCEP offers comprehensive care to hundreds of boys and girls and since its establishment has received several awards. The latest has been the award for the best social and health integration experience, which the International Foundation for Integrated Care (IFIC) awarded during the 16th International Conference of Integrated Care (ICIC16). 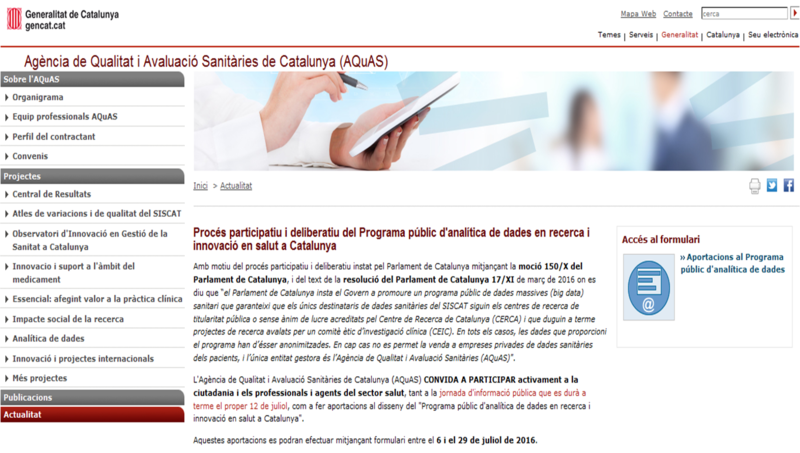 This initiative is a part of the innovation community of the Observatory of Innovation in Healthcare management in Catalonia (OIGS) and is one of the 37 experiences certified by the AQuAS. Project PRINCEP team in Sant Joan de Déu Children’s Hospital in Barcelona – Joaquín Gascón (nurse), Olga Valsells (agent of spiritual care), Esther Lasheras (social worker), Sílvia Ricart (pediatrician), Andrea Aldemira (pediatrician), Astrid Batlle (pediatrician). She is not in the picture but she is in the team Verónica Vélez (nurse). When we speak of chronic disease, we usually think of adults and the elderly, but chronic disease is also a reality in the pediatric world. The scientific advances of the last decades have increased the survival of formerly lethal diseases and that has led to the appearance of a new phenomenon: children’s chronic disease. Increasingly health systems allocate more of their efforts to chronic disease care, mainly because of the great economic impact this generates. Although various studies estimate that only 15% of pediatric patients have special health care needs and that less than 1% suffers from chronic diseases of high complexity, the estimated health expenditures for this small percentage are between 30% and 40%. When you think of chronic disease patients it is not only thinking about the managing of their health. All chronic diseases represent a major impact on the patient’s surroundings. The families must come to terms with significant changes in their lives: how to relate within and outside of the family, the problems of family and work conciliation, the difficulties for a social life or the economic problems, all of this causing major emotional changes and a questioning of values. In managing everything for the pediatric complex chronic patient, it is essential to understand that the social and family situation will have an inevitable influence on their clinical situation and therefore that it must be taken into account in the daily work. How can we respond to the specific needs of a complex, pediatric chronic patient? 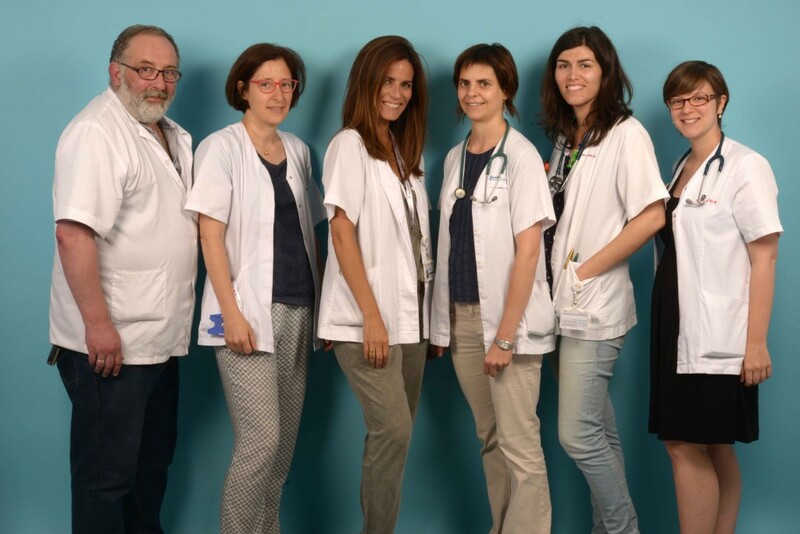 In 2012 the Sant Joan de Déu Children’s Hospital in Barcelona created the PRINCEP program, a multidisciplinary unit oriented to offering comprehensive bio-psycho-social care to pediatric patients with complex chronic diseases. Made up of pediatricians, nurses, a social worker and an agent of spiritual care, the unit seeks to optimize health resources and improve the quality of life of the patients and their families, fostering their participation in the therapeutic process, their responsibility and self-care. Since its Constitution giving service to 20 patients, it currently serves more than 100 boys and girls with chronic diseases of high complexity that require frequent use of hospital resources, tracking for multiple specialties, and a need for technological support for their daily care or a high social vulnerability. What does this innovative experience offer? Our patients have a medical team and nursing reference, which knows and manages the case on a global basis, carries out scheduled or urgent check-ups according to the patient’s needs and which also serves as a reference during hospital stays. In addition, they have telematics care via telephone, accessible 24 hours a day in case of clinical emergencies, or by email. Thus, a quick and effective response to questions or clinical decompensations can be given, unnecessary visits are avoided and the family’s trust, autonomy and self-care are favored. Since the beginning of the unit, we have found a decrease in the number and duration of our patients´ hospital admissions, as well as the number of visits to the emergency room. Since the beginning of the unit, we have reported a decrease in the number and duration of the our patients admissions, as well as in the number of emergency room visits. In the last four years, the number of admissions per patient and per year has been reduced from more than 5 to 1, the average time of admission from 13 to 4 days, and the average number of visits to the emergency room per patient and per year from 8 to 1. What does the integrated care in the context of this particular project consist of? The project PRINCEP works on external coordination, trying to encourage collaborative models of health and social care, so that families can receive the support of the health or social services closest to them that then will be integrated into the patient’s treatment plan. Social and spiritual support is also essential. Evaluating the social and family situation from the outset allows us to identify factors of vulnerability and to accompany and to prevent situations of social risk. More than 50% of the patients and families included in the program have needed a moderate or intensive intervention by our social worker. In addition, accompanying patients and their families in the different phases of the disease facilitates adherence to the treatment as well as the adaptation to the changes, and helps to strengthen the family structure and social support network. The social and emotional situation influences the health conditions and the empowerment and confidence of the families improves the clinical management of the pediatric, complex chronic patients who benefit from a comprehensive and global care. The integrated approach to children’s chronic disease favors the optimization of resources and improves the quality of life of patients and families. Post written by Andrea Aldemira Liz, pediatrician of the Complex Chronic Disease Unit of the Sant Joan de Déu Hospital (@HSJDbarcelona_es).